Why do we have bodies? Ever wonder why some spiritual paths hate on our bodies so much? If you believe you are here for a reason and a purpose doesn’t it make sense that this body thing is part of the reason and purpose? I mean it really is a pain the neck and things would be much simpler without it. So why do we have to lug it around? 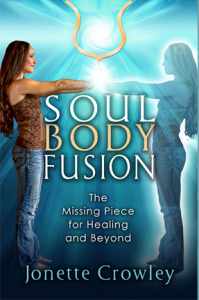 Jonette Crowley has introduced a framework she calls Soul Body Fusion. It is amazingly simple and has given folks important, lasting results. You can do it alone, with another or with many. Her book Soul Body Fusion is chock full of stories from people who have used the technique for lasting change. Want to feel more alive in your body? Jonette gives us hints for doing just that. Get access NOW to free tools available only to Sparks to Fire community members. Can You Breathe? Then You Can Change!